U19 Championship. 12th round. October 22, 2016. Schaslyve. Knyazha Arena. Att: 100. 9 oC. In the tournament table, Shakhtar and Dnipro are separated by three spots. However, the Pitmen, being the 6th, played two games less (9 matches, 16 points, the visitors - 11 games and 13 points). In the last round, Shakhtar had an away draw against Skala (0-0), with Dnipro losing at home to Vorskla (0-2). 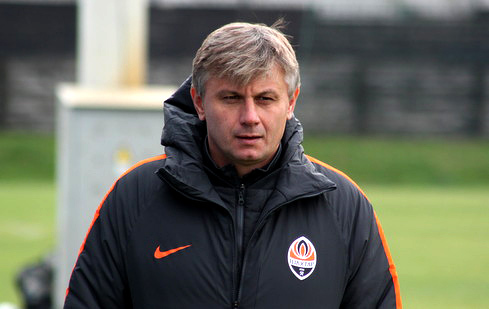 The head coach of the Orange-and-Blacks Serhii Popov, compared to the previous game, made three changes in the line-up. So, Andrii Zaporoschenko, Stanyslav Hudz and Maksym Andrushchenko were left on the bench. Instead, Viktor Korniyenko, Maksym Chekh and Murad Khachayev appeared. The opening stages were won by the Pitmen: they tried to have more control of the ball and launched attacks more frequently. On 12 minutes, Shakhtar could easily open the scoring. Dmytro Topalov charged down the left and crossed to the middle. Dnipro goalkeeper parried away the ball, but straight to Viktor Korniyenko. The Shakhtar defender failed to shoot it past numerous opponents. Nevertheless, in the very next episode the Orange-and-Blacks scored a goal. This time, Topalov did it, leaving no chance to the visiting keeper – 1-0. Shortly afterwards, the charges of Serhii Popov could extend the lead. But a cross by Oleksii Kashchuk was picked by Andrii Kulakov, with a defender turning up in the way of the ball. On 21 minutes, Ivan Budniak ran down the middle and shot it past the keeper to make it 1-1. In the remaining time before the break, the game was even with little chance of success. From the off, the players of Shakhtar settled in the opponents’ half of the field. Andrii Kulakov had a good chance to excel, but his header after a left-wing cross by Oleksii Kashchuk went just inches wide. Dnipro scored unexpectedly: on 62 minutes, the visitors’ attacking move ended with a dangerous set piece, which was immaculately sent home by Ivan Budniak - the ball hit the back of the net off the goalpost. After that, the game shifted to midfield. Towards the end of the match, the Orange-and-Blacks had several opportunities to equalize. Dmytro Topalov was shooting from the spot, but Dnipro goalkeeper rescued his team, turning the ball for a corner. Shortly afterwards, Valeriy Bondar was shooting using his head just to see his effort go above the bar. He also got on the end of Topalov’s free kick: this time the goalkeeper played well. The closing minutes saw Shakhtar attacking, but the numbers on the scoreboard did not change. The Pitmen will play their next game on 29 October. In the 13th round, the Donetsk team will play Olimpik away. - The reason behind the failure is a poor conversion rate for shots. In the first half, except the goal scored, we had three more opportunities to score, but we didn’t do it. Meanwhile, the opponents launched a counterattack and equalized. We took the pitch for the second half then, created another chance, but did not score again. Meanwhile, Dnipro dropped deeper and started to play it tight defensively. We, in turn, could not find a way to overcome the tight defence. After a counterattack, the referee pointed to the spot, with our goalkeeper making a blunder by letting the ball into the corner. In the remaining time, we lacked skill to at least level it.